I’ve mentioned this before, but I applied for the second season, thinking I had a perfect edge as a young 20-something who loved to entertain. Still not quite sure what went wrong. Either it was my video submission: we all know I’m not technologically savvy so me and a brand new digital recorder let loose on my kitchen probably made for some interesting viewing. Or perhaps it was just that they were just looking for somebody with even blonder bleached hair and a hankering for all things tequila and donkey sauce. I can only imagine why they never followed up with me. 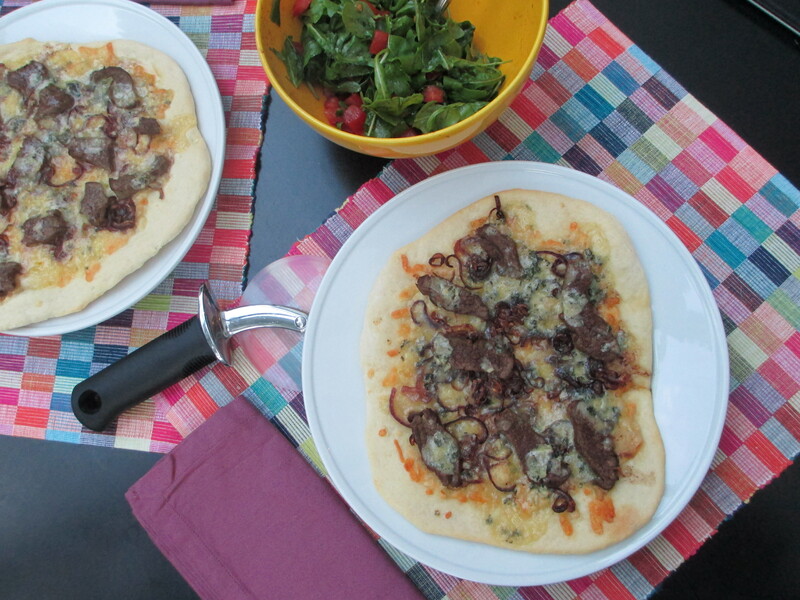 The one thing I know I had right was my recipe for Blue Cheese Steakburger Pizza. So damn good! I’m no longer that 20-something, but I still love to entertain and I still drool over this pizza! This is the original way I made it, with steak and caramelized onions, but you can also tweak it to your personal burger taste by adding mushrooms or bacon. I’ve started using “00” pasta flour for my pizza dough because I think it makes a crispier crust. And I definitely need any help I can get because my oven here just doesn’t seem to get hot enough and a heavy pizza stone was one of the things we left stateside. For a visual on how to make the dough, check out this post. Once the dough is ready, I bake the crust once with a mozzarella (or cheddar) cheese base. I realize that this recipe does not actually use burger meat, which I debated, but concluded that the flavor of the burger is there and the thin rare steak would hold up better on the pizza, as it cooks a bit more in the oven. Once the base has cooked for about 5 minutes, top with the steak and blue cheese and finish cooking for an additional 5-6 minutes. Once the pizzas are baked, I top then with a tomato and arugula salad with a mustardy vinaigrette, completing the flavors of a perfect burger. Make the pizza dough by mixing 1/4 cup warm water with the yeast and sugar. Allow to sit for 5 minutes in order to be sure it “proofs.” Using kitchen aid dough attachment (or if by hand, stir with wooden spoon and knead on floured surface for 5 extra minutes), mix together water, flour, salt, olive oil and yeast mix, until the dough comes together. Continue to knead for 3 minutes. Place dough in a greased bowl, cover with a clean kitchen towel and put in a warm draft free location to rise for 1 hour (until doubled in size). While the dough rises, caramelize the onions. Add 2 tsp olive oil to a small skillet and heat over low. Add the onions and cook, stirring frequently, until very soft, about 30 minutes. Remove the onions from the pan and increase to medium high. Sprinkle the steak with steak seasoning and sear for 1 minute on each side. Let rest. Divide your dough into two halves and roll out into circles, about 10″ across. 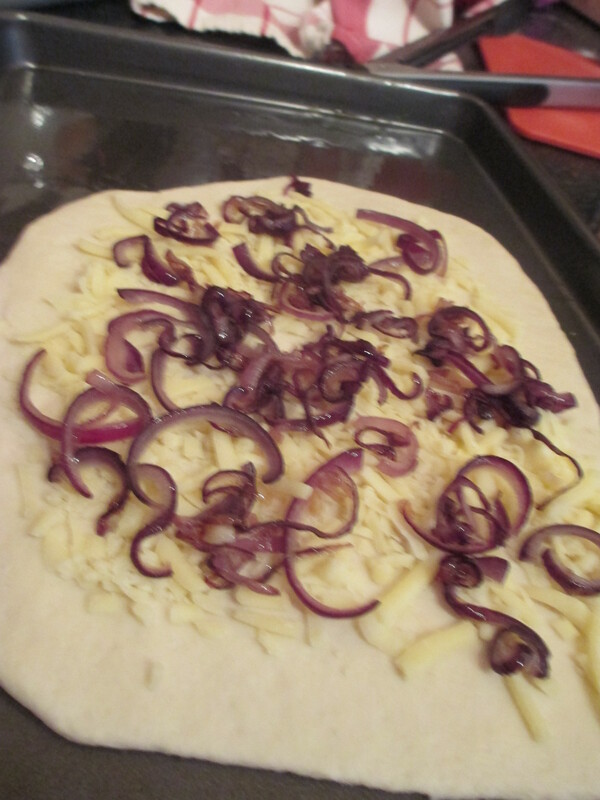 Place on a baking sheet and sprinkle each with half the mozzarella and onions. Bake for 5 minutes. 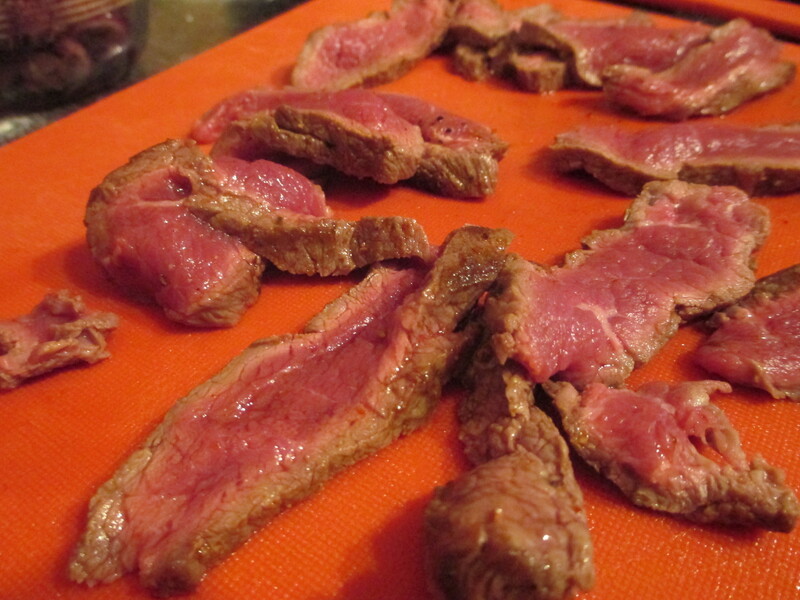 While the dough bakes, thinly slice the steak. 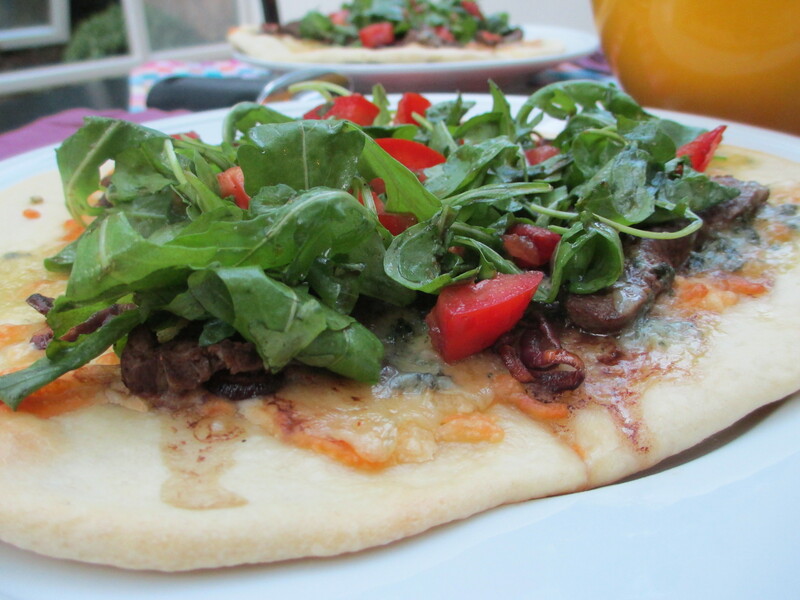 Then remove the pizzas, top with the steak and blue cheese. Return to the oven for an additional 5-6 minutes until golden brown and bubbly. 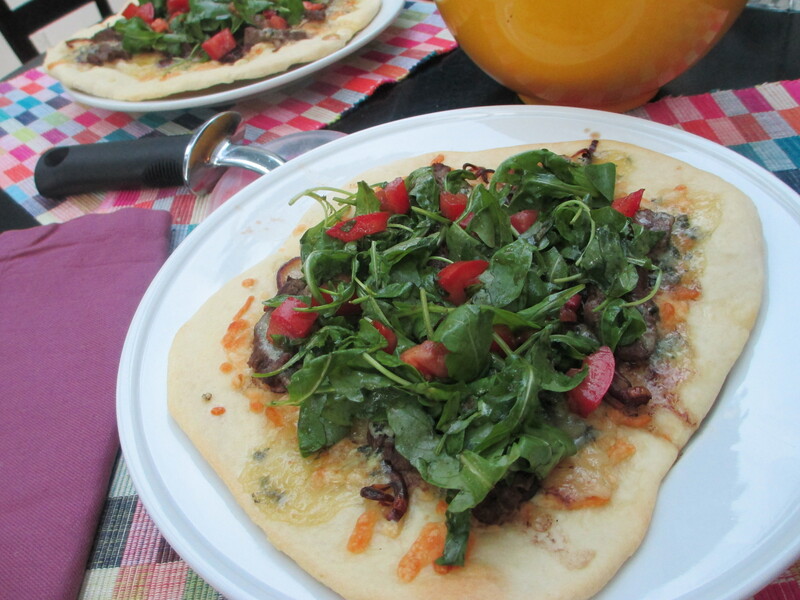 As the pizzas finish whisk the mustard, balsamic, and olive oil and toss with the arugula and tomato. Season with salt and pepper. To serve, top each pizza with half of the salad.